I think places like Rubi shoes only have to change the slightest thing and call it "inspired" to get around any laws... if there are any! I think some countries don't even have copyright laws on fashion! I would MUCH rather have the "real deal" than a Rubi knockoff, especially in this case. When it's something you've truly coveted, the authentic item is something you'll treasure, and a cheap imitation just wouldn't feel the same. 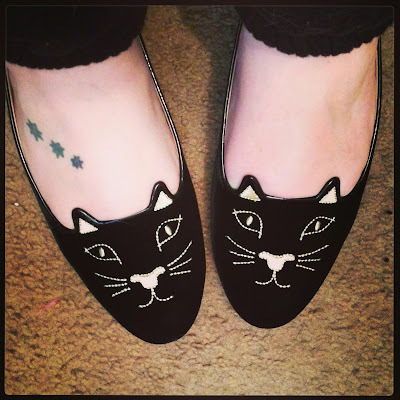 I have a pair of studded Wittner flats and they were pretty pricey, but I had tried to "make do" with a cheap pair and they fell apart and were hot and uncomfortable. I ended up taking a deep breath and buying the Wittners full price and I don't regret it at all. Even when they eventually went on sale for 60% off I didn't feel bad, they were worth every cent at full price! From that moment onwards I decided that when it comes to items where quality matters, I would get the real thing. It just feels so good and makes me happy every time I look at them. I'd love a pair of Louboutin's too! They are just so gorgeous! I have never seen those shoes but one look and I am in love. That is how I was the first time I saw them! Your shoes are just gorgeous! Love it!